As you know, your typical dog wellness exam consists of your veterinarian checking your dog’s weight and surveying his overall health. It includes a simple eye exam, dental health checkup and listening to his heartbeat with a stethoscope. Each of these offers clues as to your dog’s health, but there’s only so much you can tell from the exterior. Diagnostic imaging can help answer any questions about the internal workings of your dog. Why Would You Need Diagnostic Imaging? Imagine this: your dog is vomiting and you suspect he ate something he wasn’t supposed to ingest. 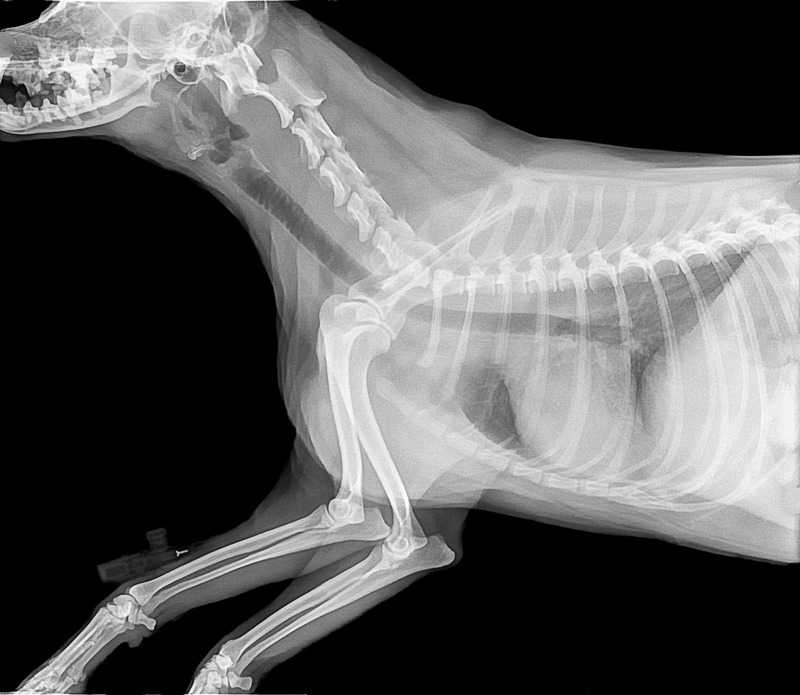 An x-ray will show us if your Fitbit is indeed inside Fido or if he’s having a reaction to something else. Or, if your dog had an accident that’s impacting his ability to walk, an MRI can show if there’s a herniated disc or another type of spinal injury. Let’s look at each of the four types of medical imaging and when they’re used. What dog diagnostic tests all have in common is that they all show internal “pictures” of different parts of your dog’s anatomy which help your veterinarian make a more informed diagnosis of your dog’s health. You’re probably quite familiar with X-rays, or radiographs as they’re also known. They’re the most common piece of diagnostic equipment we use in the veterinary hospital. The process of X-raying is the same for dogs as it is for people, though we use a smaller X-ray machine. Essentially, your dog is positioned for the X-ray beam to examine a specific location. It’s a very low level of radiation and safe for your dog. X-rays can assess broken bones, arthritis, foreign items in the digestive tract and other common concerns. We may need to sedate your dog to carry out the x-ray since sedation calms dogs, reduces anxiety and ensures we get the needed pictures. After x-rays, this is the next most common diagnostic tool. When your veterinarian suspects a heart problem, for example, they’ll likely recommend an ultrasound. It’s a better tool for showing details of soft tissues and organs than a traditional X-ray. An ultrasound machine uses a small probe pressed on your dog’s body. This probe sends sound waves into your dog, and based on the returning echoes, shows your dog’s organs and tissues on the monitor. While an X-ray will show your dog’s heart, an ultrasound does a better job of depicting the presence and type of heart disease. As you may know, heart disease comes in many forms. There can be fluid buildup, weak walls or restricted blood flow, each of which requires a different type of treatment. Often, X-rays and ultrasounds are used to complement one another. Your veterinarian may recommend a dog MRI if your dog is experiencing mobility issues. An MRI (or Magnetic Resonance Imaging) is excellent for detecting spinal or brain injuries. Your dog lays in a special machine, and a powerful magnetic field reveals your dog's internal structure. It's especially good for revealing internal bleeding or inflammation. If you’re familiar with human MRI’s, you know you’re put into a tubular device for scanning. Your dog’s experience is similar. He’ll be sedated so he remains calm and the MRI can do its work. CT scans, or “cat scans,” have nothing to do with cats and everything to do with a special type of X-ray. They focus on specific areas of your dog’s body and are often used for complex areas like the chest. They show more detailed images of internal tissues than traditional X-rays. In all, having such advanced medical imaging tools available means your dog can get the best treatment possible. Is Diagnostic Imaging Safe for My Dog? In a word, “yes.” Diagnostic imaging is safe and non-invasive for your dog. Your dog will be evaluated beforehand to ensure his safety, and your veterinarian will go over everything with you and answer any questions. Dog diagnostic imaging can help your dog live a long and healthy life by getting the very best treatment. From assessing fractures to internal inflammation, these medical imaging tools provide your veterinarian with the insight needed to recommend the best treatment plan for your dog. If you have any concerns about veterinary diagnostic imaging, or feel your dog may have an internal health issue, please make an appointment to discuss with your veterinarian.